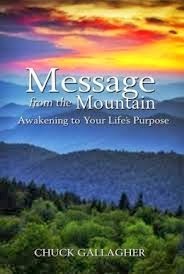 "Message from the Mountain: Awakening to Your Life's Purpose," by Chuck Gallagher, is a spirituality book about finding your life's purpose. In this book. Gallagher creates an engaging story while also prompting the reader to reflect on his or her own life and derive a purpose. The main character moves from being downtrodden to a lively individual, acting as a metaphor for what can happen if the reader pursues change. Although the story is interesting, it is the lessons the reader learns that are the highlight of the book. Gallagher makes it clear what steps someone who is feeling lost must take in order to grow as an individual, such as pursuing quiet reflection and solitude. The writing is descriptive without being too wordy, and the book is fairly easy to read. This is a terrific book who wants a quiet read about finding direction in life through reflection and quietude.